JCR is proud to present our new Cherokee rear bumper and tire carrier setup. For the first time ever on the XJ we are offering this bumper in two separate pieces. This means you can order the lower bumper portion first, then add the swing out at a later date. Or order it all at once, the choice is yours. 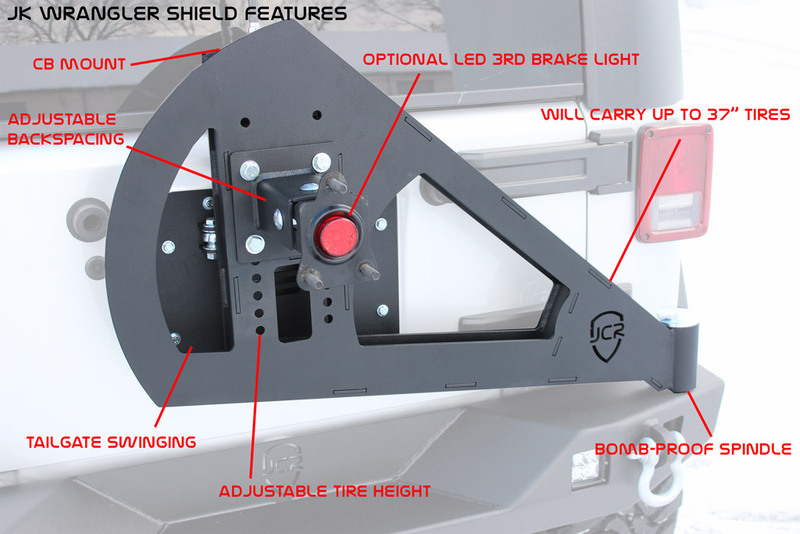 The Vanguard rear xj bumper features CNC cut and formed 3/16″ construction and comes standard with a receiver hitch, D-ring shackle tabs, Hi-Lift jack holes, and mounts for 3×3 cube LED’s (JCR 3×3 cubes, Rigid E-Series, ENGO, etc…) It also comes with a precision made, reinforced spindle sleeve to accept the Bomb-Proof spindle from the Adventure carrier. The Cherokee Adventure Carrier features an automotive style self locking latch, our Bomb-Proof spindle, and its adjustable tire mount will hold up to a 37″ tire on almost any backspacing wheel. This tire carrier will also carry up to (2) 2 gallon Rotopax cans, a Hi-Lift, CB antenna, and it even includes an illuminated license plate mount! 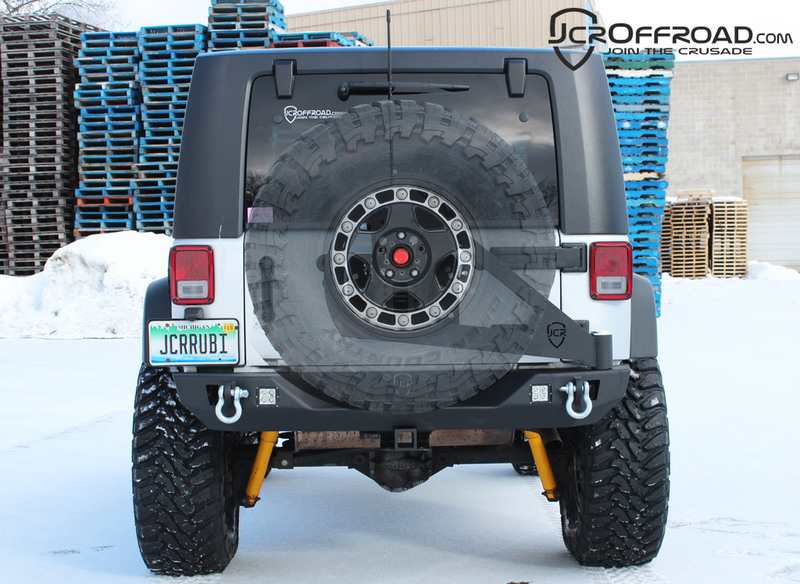 At JcrOffroad we offer two styles of tire carrier bumpers for your Jeep Wrangler JK. 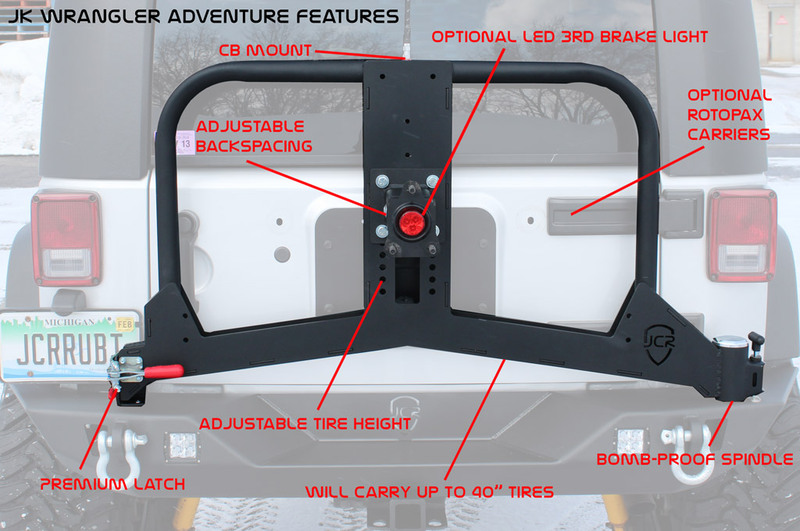 Both our Crusader and our Vanguard rear bumper have an integrated sleeve to allow you to add a tire carrier at the time of purchase, or even later down the road. This carrier features adjustable tire height and backspacing, has the option to carry a HiLift Jack and a CB antenna, and will support up to a 37″ tire. This swinging carrier can carry up a 40″ tire, two RotoPax jerry cans of your choice (gas, diesel, kerosene, water, first aid, or storage), a highlift, and a cb antenna. Both carriers feature our Bomb-Proof spindle. 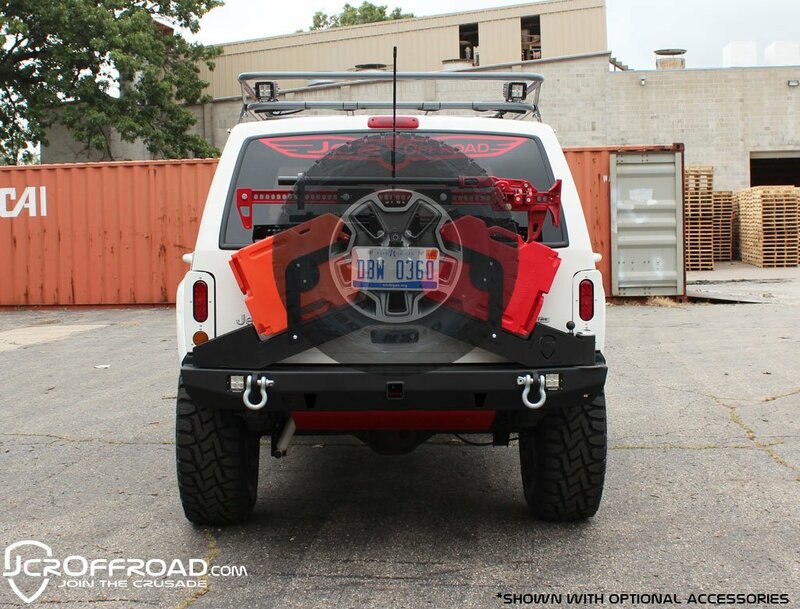 Either carrier makes a great addition to your JCR rear wrangler bumper, and will get the weight of those big wheels and tires off your tailgate.